With the exception of adults 18 to 24, all age groups had a net decrease in their usage of Facebook over the past 12 months, according to results of a user study released today by the equities research team at Raymond James. Overall, there was about a 15-percentage-point net difference between those reporting increasing their usage of Facebook (21.3%) and those reporting that they decreased it (36.1%). In addition, 7.3% reported they have discontinued using Facebook altogether. 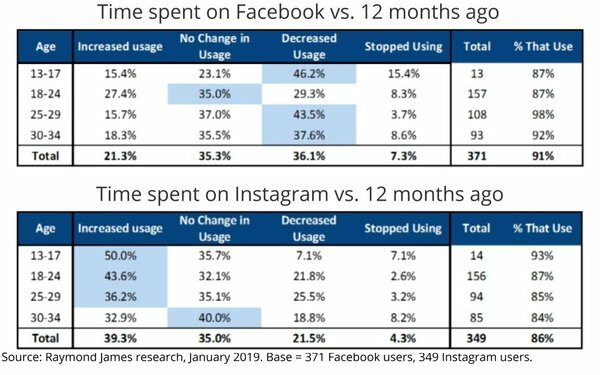 When Instagram users are factored into the equation, overall use of Facebook’s digital user universe continues to expand. Raymond James projects the fourth quarter will be up 8.4% versus the same quarter a year earlier.